Home Nederlands Actua & Analyse I Am Running for President in Turkey. From My Prison Cell. EDIRNE, Turkey — Turkey will vote in presidential and parliamentary elections on June 24. I am one of six candidates running for president. I am running from my prison cell. I am writing from a maximum-security prison in Edirne, a city in northwestern Turkey, near the border with Bulgaria. I was arrested one year and eight months ago while I was a member of the Turkish parliament and the co-chairman of the Peoples’ Democratic Party, known as the H.D.P., for which six million people voted in the last election. The Turkish government led by Recep Tayyip Erdogan’s Justice and Development Party, known as the A.K.P., has turned its back on universal democratic values and pushed the country to the brink of political and economic crisis. With the exception of President Erdogan, all of my fellow candidates have declared that I should be freed. They cast aside ideological differences and came to my defense because they know the government is holding me for its own political gain and not for any crime I committed. They understand that if I were free, Mr. Erdogan’s chances of winning the elections would be far slimmer. They recognize that no matter who wins, the imprisonment of a presidential candidate casts a pall over the legitimacy of the elections. The accusations against me in the indictments by prosecutors are based entirely on political speeches and statements that I made. If only the Turkish judiciary hadn’t buckled under government pressure and had adhered solely to the law. After my arrest I was not allowed a courtroom hearing for more than a year. My prosecution has been unjust. My arrest was a political decision. I remain a political hostage. The only vaguely sophisticated device they found in my cell was the electric kettle I use to boil water. After establishing that I could not have used the kettle to tweet, the guards left. Despite the absurdity of the incident, it was quite revelatory about the indescribable fear that engulfs authoritarian leaders when confronted with opponents who persevere despite persecution. How acute must Mr. Erdogan’s fear be? For the past three years, the A.K.P. has conducted a relentless propaganda campaign with the acquiescence of the media to undermine the Peoples’ Democratic Party by portraying our members as “terrorist collaborators.” Yet our voters and supporters have remained steadfast. But everything changed after the June 2015 elections, which saw Mr. Erdogan’s party lose a parliamentary majority. His government insisted on military intervention, and the Turkish Army moved in against the militant Kurdish youth who had set up barricades in various towns and cities. The coming elections will shape the future of Turkey. It is statistically unlikely that any candidate who shuns the support of Turkey’s Kurdish population — around one-fifth of its 81 million people — and their demands for peace can win. We are confident of crossing the steep threshold, but if we fail to get 10 percent of the vote, around 80 of our parliamentary seats will go to Mr. Erdogan’s party, which would deliver him a comfortable majority in the parliament and further ease his executive presidency. In essence, the A.K.P. rule will be unjustly secured through the votes of millions of disenfranchised Kurdish citizens. Mr. Erdogan and his governing A.K.P. are using the prolonged state of emergency and other underhanded measures to ensure that the H.D.P. doesn’t get 10 percent of the vote. periphery affects freedoms and democratic culture across the country. What was limited to the Kurds has become the norm for Mr. Erdogan’s opponents elsewhere too. The only hope for a liberal, democratic future lies in our coming together to defeat the authoritarian regime. 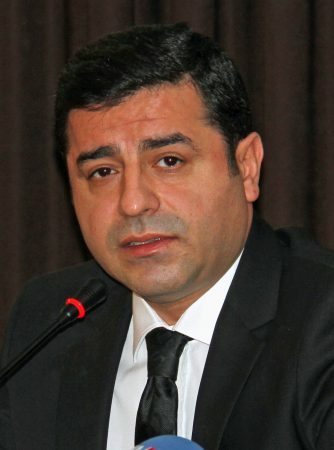 Selahattin Demirtas is the Peoples’ Democratic Party’s presidential candidate in Turkey. This essay was translated from the Turkish by Amberin Zaman.